Although ceased trading as a bookshop, the Oaks Community Centre remains open for a variety of other community activities: details may be found on the website. Nearest alternative: Trinity Coffee Shop, Aylesbury. For other Christian bookshops in the surrounding area please see the County Index » Buckinghamshire. Our bookshop stocks a range of Christian books and Bibles along with a small selection of gifts. It also has a good selection of birthday cards, anniversary cards, and other special occasion cards most of which have a Christian scripture inside. Oasis Christian Bookshop is based in Kettering at No 1 Piccadilly Buildings, just along from the old market place. We have a wide range of Christian literature for preaching, teaching, personal reflection and study, an extensive selection of Christian CDs, contemporary and traditional, also stationery, gifts, greetings cards, rosaries and a wide range of children's books. If we don't have the resource you require, we can usually get it within a couple of days. We can supply materials for stalls and events, on a sale or return basis. Give us a call on 01536 414082 or email us: we would be more than happy to discuss your requirements. At Oasis we aim to be just that, a friendly caring environment in which to browse or buy or, if you feel a need, for prayer or just a listening ear. Although there is no longer a Christian bookshop in Lowestoft, there is a Christian Café on the High Street: Footprints Coffee Shop. For Christian bookshops in the surrounding area please see the County Index » Suffolk. For other Christian bookshops in the surrounding area please see the County Index » Dorset. For other Christian bookshops in the surrounding area please see the County Index » Monmouthshire. Entry Updated: 16/5/2012 | Out of date? Daily Bible Reading Notes; Magazines; Stationery. Olive Tree Christian Resources stocks fair trade products from Created, Traidcraft, Leprosy Mission and Jubilee; children's books, Sunday School & youthwork teaching materials; candles, jewellery, pictures, posters, bookmarks and much, much more. Our tea rooms offer a stunning view on clear days. We cater for away day retreats and quiet days for churches in the windmill. For other Christian bookshops in the surrounding area please see the County Index » Cumbria. One Way UK is an inter-denominational children's ministry, specialising in equipping and training children's and youth workers. As a company, we are dedicated to helping teachers and ministers spread the gospel by providing quality, fundamental Christian resources. Children's Ministry; Creative Arts; Puppetry. Onesimus Books have been established for more than 25 years selling secondhand religious books via mail order. We have a stock of over 10,000 titles, covering most Christian, biblical and theological subjects, with a special interest in Church Organs and Church Music. We also operate a 'Wants and Search' service, where we can check our stock for titles that customers require. Previously trading as Footprints, this shop was acquired by Open Door Trading in September 2010, but was reported Ceased Trading in December 2011. Entry Updated: 10/12/2011 | Out of date? We operate in the market town of Oswestry, Shropshire, on the border of Wales. Our long established business (launched in 1979) is situated in an attractive 18th Century listed building. 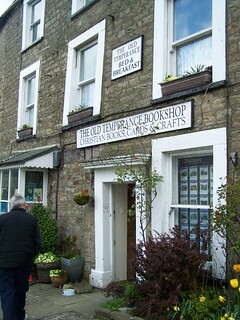 Opportunity to browse and order literature is helped by the serving of refreshments within the retail area of the shop.